One Earth At A Time! Dozens of supervillains dream of destroying the Earth, but only the madman Omega, Lord of the Terminus beyond space and time, has the means to destroy four Earths, setting in motion a cascade effect that spells doom for the omniverse. With the Freedom League battling the Crime League in orbit, the Atom Family in Timbuktu, and the Next-Gen studying for finals it falls to your team of superheroes to put an end to Omega's dastardly schemes! Time of Crisis, a world-spanning adventure for the Mutants & Masterminds roleplaying game, challenges our heroes to save not just one Earth, but four! Don your masks, unfurl your capes, and kick-start your power armour. It's time to save the worlds! 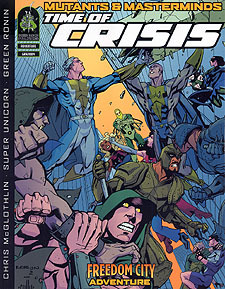 Although Time of Crisis is appropriate for any superhero setting, it has been designed for use with the Freedom City sourcebook also available from Green Ronin Publishing.